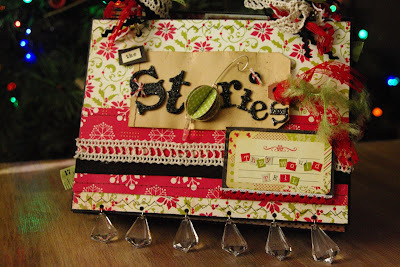 I created this keepsake album as a place to tell those stories of your beloved Christmas ornaments and keepsakes made by those precious hands or handed down from other generations. It is available to purchase at The Scrappy Gourmet now at a great price... Only $38! 16 pages (including front & back pages) to capture your memories of those special keepsakes! Great album and love the little ornament on the front..and the crystals! That is a lovely idea. I wish I had the time and energy to do it right now because I don't want those stories to get lost. We have one of those trees that has all of the meaningful things we have collected during our marriage and as parents. Well, our tree is going to be up for awhile. We are headed to Stanford some time this week and will not get he treendown until we get back (with friend's help, thank God!) Maybe I will feel more energy towards doing this then! Thank younso much for writing on Jud's Caring Bridge. It means a lot to both of us. Just dropping by to wish you and your family a Happy New Year. Let me know what events you are doing this year....I'm up for another class! Another beautiful creation made by you:) Wishing you much love & happiness in 2011!